You work hard for your paycheck, and every dollar counts. So you might be surprised to learn that getting underpaid is quite common, and not every employee realizes it’s happening. Employee rights lawyers recommend verifying the accuracy of every paycheck you receive before you deposit it. If you do think you’re being underpaid, talk to an employment law attorney in San Jose, CA right away. Look for common pay stub errors. Many different payroll errors can result in you receiving a smaller paycheck than you should. As you examine your pay stub each week, ask yourself the following questions. Is the rate of pay correct? Did I get paid time-and-a-half for overtime? Did my employer take out unusual deductions? Report the mistake to human resources. It’s possible that a too-small paycheck is simply due to a clerical error. Visit your company’s human resources department to discuss the issue. You have the right to request a timely payment of the money you’re owed. In most cases, your employer should include compensation in your next paycheck. Maintain your own work records. Whether or not you’ve previously detected paycheck errors, it’s good practice to retain your pay stubs and keep your own records. Keep a small notebook in your car or desk, and write down the times you arrive at work and leave each day. Add up the hours and make a note of whether you’re owed overtime pay. 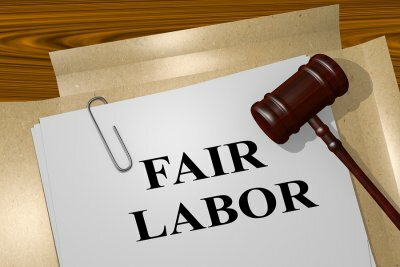 Talk to a labor attorney. Contact an employment lawyer, and schedule an initial consultation. Bring your recent pay stubs and any other relevant documents, such as your employment contract if you have one. Your lawyer will review these documents, explain the applicable labor laws, and discuss your options. In some cases, employers are more willing to pay what they owe their employees when they learn that a lawyer has been retained—even before an official complaint is filed. If you’re still denied the pay you’re entitled to, your employment attorney can file a lawsuit. Your lawyer may recommend that you speak privately with your co-workers to find out if they’re also being underpaid. You and your co-workers may pursue a collective action against the employer. In litigation, there can be strength in numbers. What Is the Harm of Hugs in the Workplace?